Spring is here and along with it comes the seasonal cleaning (especially since Marie Kondo arrived on the Netflix scene). While you’re checking off your to-do list and deciding whether your clothes and home décor spark joy, stop and give your exterior doors a second thought. Do they spark joy? It’s easy to feel like the doors that came with your home are a permanent, static element that can’t evolve with your style, but that’s simply not true! Doors in the metro New Orleans area have always been ahead of the design curve when it comes to using bold color to complement the vibrant city. Unfortunately, bold colors tend to show more imperfections and if it’s been a while, then you’re probably seeing the cracking and peeling that came along with older methods of paint. We recommend a semi-glaze paint because it won’t show fingerprints that you would see in a satin or flat paint. We offer white and black paint colors from Benjamin Moore and Sherwin Williams in our exterior latex paint that protects against wear and tear from weather elements and humidity making it ideal for New Orleans area homes. However if you have a different or custom color in mind, simply Click Here to find your color of Benjamin Moore paint or Click Here to view the Sherwin Williams collection and bring it with you to the store or email us and we’ll make sure your door is the exact color of your choosing! 2. Accessories are the Exclamation Point on your Home! The hardware on your doors can occasionally take a back seat to the larger more glaring details. We’ve always thought that the design is in the details and nothing makes your home POP like updating the hardware especially if you’re working with an outdated style or a worn, dull lockset that needs to be replaced. We host a plethora of exterior accessories! From hardware and mailboxes to address markers and plaques, an update on the little touches will take your traditional Louisiana style home to the most authentic level or update your home to that clean modern look. Transoms are a great way to let in some natural light to your home if you have an opaque door or if you simply love the natural light element in your home and you just can’t get enough! Originally used as structural support, these beautiful accents are now achieving that beautiful marriage of fashion and function. Transoms can be installed over your front door, in the place of an exposed beam in your internal design, or even over the top of bedroom or extra room doors. The options and styles are endless! Are your doors suffering from exposure to weather or just normal wear and tear? Refinishing could be the answer to your prayers! Stains and Varnishes go together like peas and carrots, or Forrest and Jenny. Stain is a colorant that is dissolved in a solvent, which means that it will not seep into the pores of the wood and can be removed more easily than paint. Varnish is a wood finish that is applied to either provide a glossy finish or to protect the wood and perhaps stain underneath. It is made from materials including drying oil, resin and solvent. With many stains you will also need to apply a finish or varnish over the top in order to protect the stain from deterioration and provide a glossier finish and look. Our advice is this; Before you hire a handyman with limited experience in door refinishing, talk to our Doors of Elegance experts and compare prices – you’ll be glad you did! Everyday life is hard on your front door. Harsh sunshine, driving rain, and regular aging can make your front door less than picture perfect. 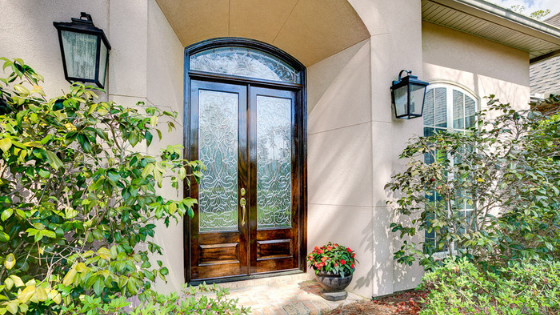 If your front door is damaged, weathered, waterlogged, peeling, outdated, or just plain old (and you live in metro New Orleans or Baton Rouge) we can help! Why not replace your front door with a brand-new replacement door? Whether you’re giving your whole house a total makeover or just want to add a little curb appeal, a new door can alter the look of your whole home. Custom options even allow you to mimic the style of other features like fencing, railings, gates, or light fixtures. Our wide selection of in-stock items lets you mix and match. We will help you replace your worn-out, outdated, or damaged front door with a replacement from our large selection of in-stock doors. We also offer custom door options if you’re looking for something unique. Whatever your makeover goals for internal or external doors this Spring, Doors of Elegance is here to help. Shop online or come visit our newly renovated showroom located at 3100 Kingman Street in Metairie. Showroom hours: Monday – Friday 10:00AM – 5:00PM and Saturday 10:00AM – 2:00PM. > Click here to view a map to our location or give us a call today!